World meat consumption topped 30 million tonnes in 2010. Our appetite for meat is increasing at a faster rate than the world population. 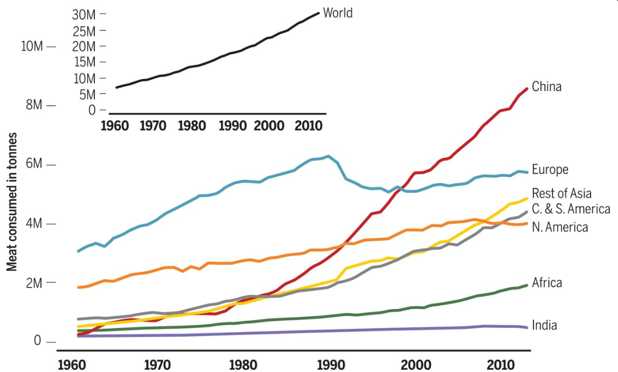 Globally, both the average per capita consumption and the total amount of meat consumed are higher than ever before. This imbalance is bad news for the environment and our health, a major new study warns. The report, published in the Journal of Science, points to two main factors driving the increase. The global population is growing, which lifts overall demand, and individual average incomes are rising so more people can afford to eat meat. The rate of growth in meat-eating differs between regions. High-income countries show static or declining total meat demand, compared to middle-income nations where there is a moderate to strong rise. In low-income countries average demand for meat remains relatively low and stable. In 2011, according to the Economist, the combined global total of chickens (19 billion), cows (1.5 billion), pigs (1 billion) and sheep (1 billion) outnumbered humans by three to one. World meat consumption topped 30 million tonnes in 2010. China has experienced meteoric growth in the amount of meat its citizens consume (over 8 million tonnes in 2010), along with other parts of Asia (over 4 million tonnes) and countries in Latin America (also exceeding 4 million tonnes). North America followed a steady growth pattern, but consumption has declined in recent years. Europe peaked (at over 6 million tonnes) at the end of the 1980s then dropped, but consumption has been climbing again. African countries have experienced much lower growth, eating less than a quarter of China’s amount. India consumes even less, with consumption remaining well below 1 billion tonnes. The paper points to the harmful effects on the environment of unchecked growth in meat consumption. Rearing livestock produces higher carbon emissions than growing vegetables, fruits and grains. Currently, livestock production is responsible for 15% of all carbon dioxide, methane and nitrous oxide emissions. Animal production contributes to a loss of biodiversity, as forests and untamed land are turned into agricultural fields to grow animal feed. The analysis found that already-strained water resources are being further depleted, as rivers and lakes are drained to irrigate land used to grow corn and other animal foodstuffs. Another area of concern is the potential impact of a heavily carnivorous diet on health. Meat is a good source of nutrients for low-income households, but a meat-heavy diet has been linked to incidents of colorectal cancer and cardiovascular disease. What will we eat in 2030? According to OECD expectations, chicken will account for nearly half of meat consumption growth in the coming decade. There are fewer detrimental health effects associated with chicken than red meat, which is good news as it is predicted to replace pork as the world’s most consumed meat by 2020. Chicken farming also produces fewer harmful emissions than rearing cows, so a mass switch from red meat to poultry could significantly reduce diet-related greenhouse gases and be kinder to the environment. However, this goes little way to solving the fundamental problem of a growing population demanding more and more meat. The report points to a general perception of meat as either natural, normal, necessary, or nice. In each case, meat is often seen as a central part of the human diet, which discourages us from making changes. However, attitudes can be changed. Most governments regulate the production, supply and distribution of meat to protect consumers from unsafe practices. They are also uniquely placed to work with health organizations to educate people about meat consumption. Although changing attitudes to meat-eating won’t happen overnight, it could be helpful in persuading people to switch to a more planet-friendly diet.